This isn't an original thought of mine... I saw another list done here recently, but I have different ideas of what should be at the top of the list (and my list is a top ten, LoL). Keep in mind, this is based off of shows that I watch, so things like Hayden & Christine on Coach aren't gonna make the cut, regardless of how interesting that may have been. 10. Danny & Vicky on Full House. They show up so low on the list because I never really warmed up to Vicky. Sure, Danny and the kids liked her, but I kinda wished Danny would have made it with Cindy (about two seasons before Vicky showed up, LoL), plus then we'd have Rusty in the picture for the girls to contend with. 9. Sam & Diane on Cheers. I think I would be more intrigued by Frasier & Diane, but I haven't seen any episodes that dealt with that. Anyway, Sam and Diane have a tortured history, and several really bad breakups along the way. It makes the list today because Diane left with the promise to return after she finished her novel... even though Sam knows it'll never happen. 8. Will & Lisa on The Fresh Prince of Bel-Air. I liked Lisa a lot, but didn't think she was right for Will. But I think she does make a good sister to him. That's right. The second time the couple tried to wed (the first was the Shaft wedding in Vegas), they called it off and their respective parents married each other. Strangely, Lisa is never seen again. 7. Ted & Stella on How I Met Your Mother. We all kinda knew that Stella couldn't be the mother of Ted's children (it just didn't seem logical), but it would've been interesting if he had a first wife before the mother, LoL. Stella leaves Ted for her ex-husband and father of her child, and Ted is devastated. I'll never forget how sad he looks on the ferry boat. 6. Luke & Lorelai on Gilmore Girls. They belong together. Truly. From their first interactions, I think many fans wanted them to come together. It took four seasons for them to kiss, another for the engagement, and sadly it comes to a close when Lorelai doesn't want to wait any longer, and Luke does. Then there's an awkward phase (that seemed like forever!) before the two seem to rekindle in the series finale. It could've been a beautiful marriage. 5. 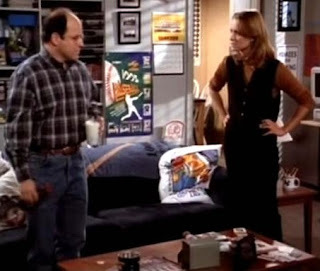 George & Susan on Seinfeld. I think this one wins in the comedy department. It all starts when George & Jerry decide to "grow up" and settle down. But, when George decides he doesn't want to get married after all, he tries like HELL to break up with Susan. She turns into the world's most-accepting woman and puts up with everything he does. The only way the wedding gets called off is because she dies, poisoned by the glue on the wedding invitations. Classic. 4. Sabrina & Aaron on Sabrina, The Teenage Witch. Yeah, yeah. You probably stopped watching that show about the time Sabrina went off to college and lived with Soleil Moon Frye, LoL. But, it kept going for several years, and she eventually meets a guy named Aaron in the (middle of the) final season (although I think she would've been better with Josh!). They date for about 5 episodes, are engaged for about 5 episodes, and then she calls it off because she realizes that Harvey is her soul mate. Best part of the wedding? Zelda is a candle so Sabrina's mother can attend her daughter's wedding. 3. 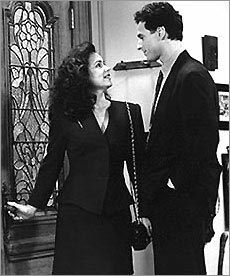 Donny & Daphne on Frasier. I never liked Donny (I wanted Niles to have her and be happy, LoL), and was surprised when the pair got engaged. This episode gets ranked so highly purely because of the craziness that takes place in the wedding episodes. Not only are Daphne's brothers so much more than a handful, Niles and Daphne constantly being interrupted by one thing or another. And, let's not forget, the moment on the balcony where we were all pulling for dear, sweet Niles, was one of the most dramatic scenes EVER. 2. Brandon & Kelly on Beverly Hills, 90210. These two went through a million different problems through the years. They first seriously consider marriage at the end of Season 5, miscarry at the end of Season 7, get engaged toward the end of Season 8, and the wedding goes awry in the Season 8 finale. Really, the couple just decides that they have too many doubts. But they were TOO CUTE together! And Jim and Cindy's return to see it happen was great. And as much as I liked her with Dylan, he could have Brenda. I really wanted Brandon and Kelly to work out. In fact, I think I still do (I don't watch the newest spin-off, but I hear Brandon has made an appearance... and Kelly is a regular...). 1. Simon & Rose on 7th Heaven. She was all wrong for him. I don't know that many people were pulling for them at all! But, it was still an amazing set-up. And the fact that they still had the party without the wedding was fun, because we heard about the three oldest children all expecting twins! It made for an interesting (faux) series finale, and for a crazy start to what became the final season (poor Lucy and her miscarriages).